The 2014 Peter Melendy Distinguished Community Builder Award is presented to C. Hugh Pettersen for his visionary ideas and dedication to the community. Much of what Hugh did was done quietly, behind the scenes, such as offering to pay to have the front doors of the Hearst Center refinished this summer. His actions served as an inspiration to everyone whose life he touched. He did so much that helped so many — from the artists who benefit from the exposure they get at the College Hill Arts Festival and the students who receive scholarships thanks to his fundraising efforts to the College Hill businesses that profit from his vision and the people of Cedar Falls who have a municipal art center thanks to his influence on James Hearst. Hugh Pettersen was a man who volunteered his time and talents again and again and provided leadership and inspiration by his personal example and by his accomplishments. The community is a far richer place because of Hugh. Unfortunately, Hugh died the evening of October 23, a few hours after the Cedar Falls Community Foundation board voted to honor him for his contributions to the community. Clarence Hugh Pettersen was born in Brooklyn, New York, but grew up in Forest City, Iowa, where his father was — as Hugh put it — a “Norwegian Methodist minister.” He attended public schools in Forest City and considered it his home. He graduated from the Iowa State Teachers College (now the University of Northern Iowa) in 1955. For years, Hugh Pettersen was known as the unofficial “Mayor of College Hill” because of his involvement in and promotion of many College Hill activities. He was active in the College Hill Merchant and Professional Organization, serving as president for three years. He promoted cooperation between the merchants, the professionals, the community, and the university, and helped organize the College Hill Neighborhood Association. In recognition of his contributions to the College Hill neighborhood, the Cedar Falls City Council in 2010 voted to rename Dry Run Creek Plaza on College Hill as Pettersen Plaza. 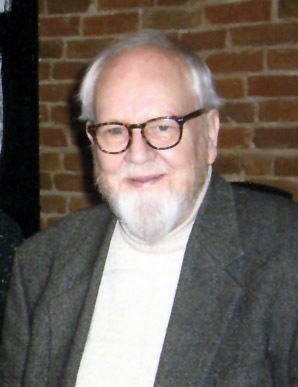 In 1979 Hugh founded the College Hill Arts Festival, which began on the sidewalks of the College Hill business district. There were 35 artists showcasing original artwork during that first year. Hugh served as director until 1994, when he handed over the reins to Karen Mukai and Len Froyen. Under his visionary leadership, the festival grew into a top-ranked national arts festival. This year, the CHAF celebrated its 36th anniversary, with 75 artists from all over the United States. The CHAF is still staffed entirely by volunteers. Each year, it provides the Cedar Valley community with an opportunity to connect with nationally known artists. While at Iowa State Teachers College, Hugh Pettersen had been a student of Iowa’s unofficial poet laureate, James Hearst, whom he held in awe. He had an idea that the James and Meryl Hearst’s home would make a good arts center for the City of Cedar Falls. He asked Lyle Baum to make the suggestion to the Hearsts, and they agreed, leaving their home and the seven surrounding lots to the City, along with $300,000 to help with the remodeling. Hugh was a member of the Task Force that planned and developed the James and Meryl Hearst Center for the Arts. He then served on the Cedar Falls Art and Culture Board, which administers the Hearst Center, for six years. Hugh said that the Hearst Center was the accomplishment of which he was most proud. For 25 years, the Hearst Center has provided a showcase for the visual and performing arts, enriching the lives of citizens of all ages. For over 20 years, Hugh generously supported the music department at UNI as an organizer of the annual Scholarship Benefit Concert. In addition, he was long-time supporter of the Metropolitan Chorale as a participant, board member, and officer, serving as president for five years. As a member of the board of Friends of the Gallagher Bluedorn Performing Arts Center on the UNI campus, Hugh decided that a fundraiser was needed to assist in the Center’s programming. In 2000, he came up with the idea of a spring concert, which would include performers from the community as well as the University. The performers were selected not just for their talent, but because they and their followers would come to the GBPAC. The first year, 1000 tickets were sold, raising $11,000 to benefit programming for the entire community. This year marked the 14th anniversary of Crème de la Crème, which has become a highly anticipated annual event. Hugh Pettersen was a kind, gentle, modest man who was uncomfortable with the numerous accolades he received in his later years. His awards include the City of Cedar Falls Distinguished Service Award (1993), Volunteerism Award from the Cedar Falls Community and Cedar Falls Chamber of Commerce (1997), Business and Industry Appreciation Award from the City of Cedar Falls and Chamber of Commerce (1999), Sertoma Service to Mankind Award (2003), Cedar Falls Representative Citizen Award (2008), and the Howard V. Jones Award for Leadership and Philanthropy in the Arts Award (2012). Hugh was the first recipient of the Gallagher Bluedorn Outstanding Service to the Performing Arts Award in 2010. The following year, the award was renamed after him. This year’s Peter Melendy Distinguished Community Builder Award was the last made to him in his lifetime. A memorial concert honoring Hugh was held Saturday, January 24, 2015, at the Gallagher Bluedorn Performing Arts Center.